Masterweld 400A MIG GUN 15' TWECO Lincoln welder WM connection - Made in USA. This is a great replacement for the Tweco 4, 15 ft. 035.045 diameter welding wire. Fit The following Lincoln machines. WIREMATIC 250, 255 (NOTE: INTERFERENCE WITH STANDARD HANDLE GUN SHROUD), SP-85, SP-86, SP-100, SP-100T, SP-125plus, SP-130, SP-130T, SP-150, SP-170, SP-200, SP-250, IDEALARC SP-255, MIG PAK10, MIG PAK 55, WELD PAK 100, POWERMIG 255, POWERMIG 200, 250 AND 300, POWER MIG 200 AND 250, POWER FEED 10M, POWER FEED 25M, DH-10, LN-10 (NEW STYLE) & STT-10. Fit the following Hobart Machines. BETA-MIG (NEW STYLE), BETA-MIG250 AND 251, DUAL FEEDER, DIGITAL 2000, DUAL DIGITAL, PORTA FEED 17, ULTRA FEED 1000, 2000, 2400, HANDLER, OSCAWA, HEFTY CV/CC. Uses standard Tweco style consumables. Comes with: 14-45 contact tip, 54A gas diffuser, 24A62 nozzle & 44-3545-15 liner. We are open M-F 8-4 Eastern. We get it to your door. Warranties may not be honored in all countries. All payments in US dollars. Thanks for your interest in Netwelder. In business since 1968, our mission is to provide the best welding equipment and supplies at an affordable price. We will be adding extra features and new products often, so come back regularly. Be the First to Know. Get all the latest information on Events Sales and Offers. Sign up for newsletter today. 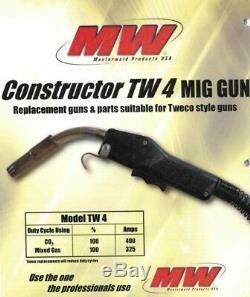 The item "Masterweld 400A MIG GUN 15' TWECO Lincoln welder WM connection Made in USA" is in sale since Thursday, July 27, 2017. This item is in the category "Business & Industrial\CNC, Metalworking & Manufacturing\Welding & Soldering Equipment\Welding\Welders, Cutters & Torches\MIG Guns & Torches". The seller is "netwelder" and is located in Indianapolis, Indiana.